1801 Draped Bust silver dollars are among the scarcer issues of the series designed by Robert Scot. While the 1801 dollar is indeed a tougher silver dollar to locate, it is by no means an extreme rarity. The 1801 Draped Bust dollar is collected by many hobbyists and often most often turns up in type sets of early American coinage or Draped Bust dollar date sets. The Draped Bust dollar bears an obverse image of a rather matronly Miss Liberty wearing a gown that drapes her bosom. The reverse of the 1801 Draped Bust dollar depicts a large heraldic eagle, with its wings and tail virtually touching the reverse rim. The 1801 Draped Bust dollar has a mintage of 54,454 pieces, which is a considerably low even among the standards of early 1800s United States coinage. 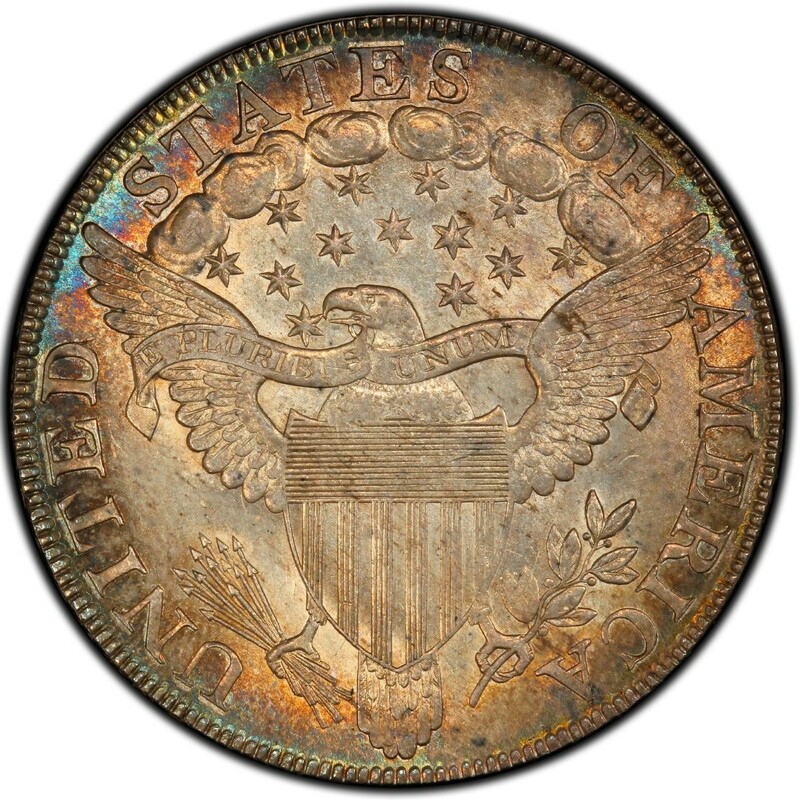 Today, it is thought that perhaps around 2,000 still exist in all grades, making it a very scarce coin on the scale of the 1797 dollar – not highly rare, but very challenging. Many 1801 silver dollars that come available for purchase seem to show some signs of damage, including cleaning, holes, gouges, or other serious issues. These damaged coins are still collectible due to the overall scarceness of the 1801 dollar but do tend to sell for substantially less than problem-free specimens. A well-worn 1801 silver dollar with more serious issues might sell for between $500 and $800. Meanwhile, problem-free 1801 Draped Bust dollars in a grade of Good-4 or higher sell for about $1,050 to $1,200 and up. 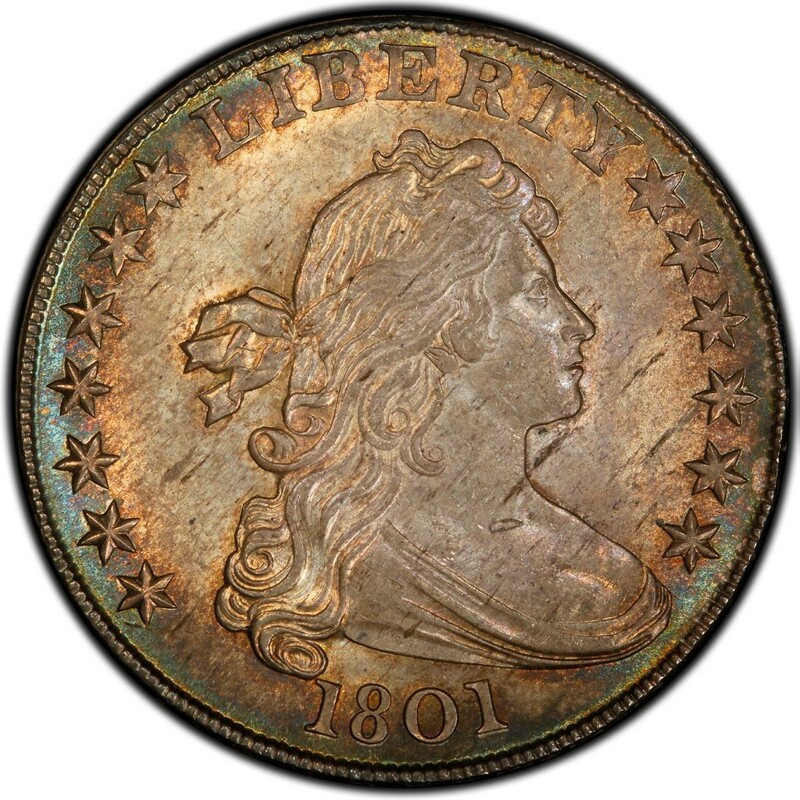 There are at present no major attributed die varieties of the 1801 Draped Bust dollar that are actively traded on the market. This is a departure from most Draped Bust dollars, which exhibit any number of different die modifications during the course of any given year.